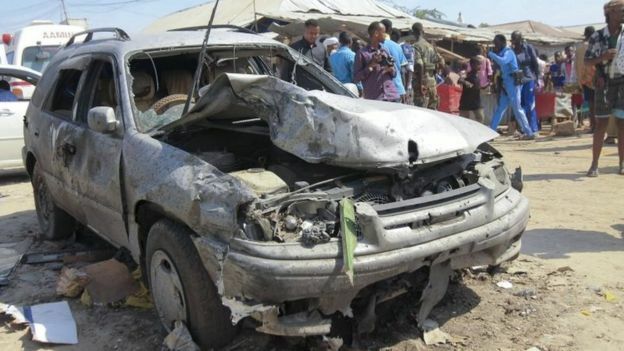 At least 34 people have been killed and about 50 injured in a car bomb blast in the Somali capital, Mogadishu. The car blew up in the city’s southern Madina district, officials say. 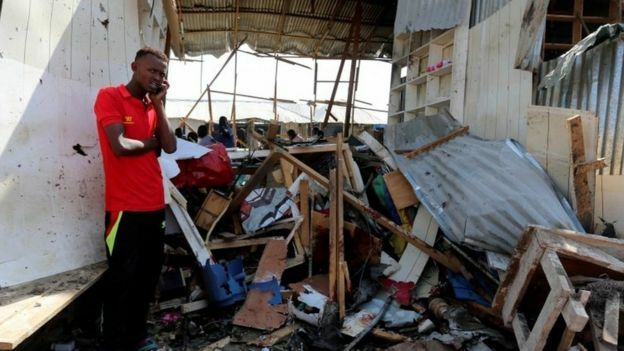 The blast – which ripped through shops and food stalls – is the first major attack in the capital since the election of President Mohamed Abdullahi Mohamed earlier this month. No group has claimed responsibility, although al-Shabab militants are likely to be the prime suspects. On Saturday a senior al-Shabab commander vowed to target the president’s supporters.Sheikh Hassan Yaqub said that anyone who collaborated with the new president – who he described as evil-minded – would be at risk of attack by the Islamist group. resident Mohamed has condemned the bombing, accusing al-Shabab of being behind the attack. He urged Somalis to unite against the group’s brutality. The new president visited some of the wounded, as well as the site of the blast on Sunday. He has offered a $100,000 reward to anybody who supplies information leading to the capture of those responsible. “It was a horrific and barbaric attack only aimed at killings civilians,” he said. An ambulance driver told the Associated Press that some of the injured had died on their way to hospital. Witnesses on Sunday spoke of chaos and carnage in the aftermath of the explosion, which some reports said was caused by a suicide bomber. Shocked and grieving onlookers watched as ambulance workers desperately tried to take the injured to hospital. “I was staying in my shop when a car came into the market and exploded. I saw more than 20 people lying on the ground. 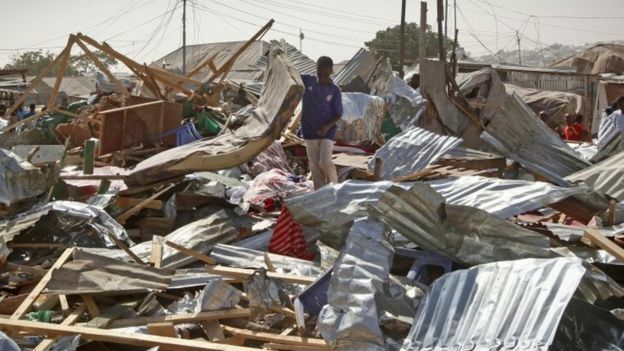 Most of them were dead and the market was totally destroyed,” eyewitness Abdulle Omar told the Reuters news agency. Other witnesses said the bomb went off at a busy junction where soldiers, civilians and traders congregate. “There were many small scale traders alongside the road and teashops and restaurants. There were also members of the security forces and shoppers and the blast was so huge,” Sumayo Moalim told the AFP news agency. The attack underlines the magnitude of the challenge faced by the new president whose administration relies heavily on international support and does not control all of Somalia. Troops from the African Union forced al-Shabab out of Mogadishu in 2011, but the militants remain powerful in some rural areas.